Iran is threatening the United Arab Emirates again over claims on three islands in the Persian Gulf. Iran is againi threatening the United Arab Emirates over claims on three islands in the Persian Gulf. Iranian Foreign Ministry spokesman Ramin Mehmanparast issued a statement Tuesday warning that “repetition of baseless claims on three Iranian islands will leave negative impacts on relations” between Iran and the UAE. UAE officials allegedly raised the matter with U.S. Secretary of State Hillary Clinton, according to the official Islamic Republic News Agency (IRNA). "Any country country seeking to spread discord instead of bolstering common grounds should expect it negative impacts on its relations with Iran,” warned Mehmanparast in his statement. "If baseless claims against Iran continue to put Iranian national interests at risk, relations will be lowered or even severed,” he added. "All countries in the region and the entire world are quite aware that these three islands belong to Iran and the UAE itself know (sic) that they are integral parts of Iranian territory and the issue has been cited in educational and historical books of Iran and that of the Persian Gulf littoral states,” commented IRNA. "If they seek to pursue an illogical approach about the misunderstanding, they should know that Iran never compromises with anyone who seek (sic) to violate Iranian territorial integrity,” said Mehmanparast. As is often the case with Middle Eastern Muslim countries, however, the spokesman sought to displace the blame for the dispute with its neighbor on to Western elements. “Iran deems it necessary to give a proper diplomatic response in line with national interests and thwart enemies' plots to sow discord among regional states,” he said. Iranian smugglers have helped their fellow citizens -- at least, those who can pay -- to survive the impact of the international sanctions imposed on Tehran. The young skippers have been loading goods at the Omani port of Khasab and sailing them across the Strait of Hormuz in the Persian Gulf at the rate of several cargoes a day. 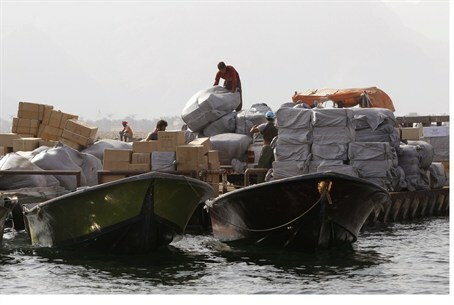 The small boats are loaded with everything from soft drinks to mobile phones and cosmetics, purchased in the flourishing UAE trading centers and then sold to Iranian merchants. Iran, Oman and the UAE are all geographically close to one another, with historic trade and finance links that bolster a thriving trade relationship which has undermined the impact of the economic sanctions imposed by the United States and its allies -- until now.